From a ground-floor facility located on a busy commercial thoroughfare in the predominantly Hasidic neighborhood of Brooklyn’s Borough Park, Alexander Rapaport has a front-row view of some of the uglier snapshots of Jewish life in America. 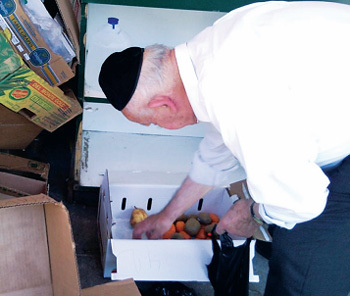 “I have seen horrific scenes—people picking food from Dumpsters, people picking up bread from the ground that was [meant] for birds,” says Rapaport, executive director of Masbia, New York City’s only free full-service kosher soup kitchen. Venture inside and any doubts about the need for places like Masbia are put to rest. It’s packed. When Masbia opened in 2005, volunteers served an average of eight meals an evening, primarily to men on their way to and from shul. Today, the number of nightly diners has grown to more than 200. That number also spans a wider demographic. It’s no secret that poverty exists in the United States and that it has been exacerbated by the nation’s recent economic turmoil. According to the latest U.S. Census Bureau statistics, more than 37 million Americans do not have enough money to take care of the basics—food, clothing, and housing. What might come as a surprise is how many Jews are among the struggling. According to the 2001 Jewish Population Survey (the latest complete numbers available), approximately 7 percent of the American Jewish community lives below federal poverty lines—a family of four making $22,050 or less—while more than 14 percent hovers precipitously close. This translates to more than 700,000 Jews, including 190,000 who are children. But anecdotal evidence—for instance, three more Masbia soup kitchens are in the works— and an increase throughout the United States in those asking for help indicate that the number has surged. 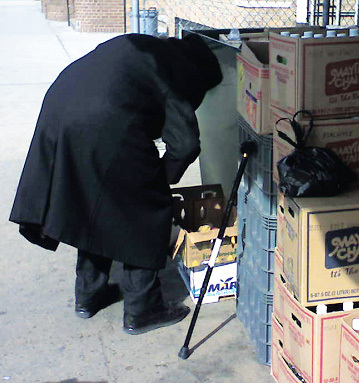 According to Rachel Wizenfeld, communications coordinator at New York City’s Metropolitan Council on Jewish Poverty, there are generally three groups of Jews who are in need of help: working families who live near the poverty line; immigrants—mostly older—from the former Soviet Union, Israel, and elsewhere who have language, education, and other barriers to financial health; and seniors, including Holocaust survivors, widows, and widowers, who can no longer afford their homes and other living expenses. B’nai B’rith International has long been aware of the necessity to help with the lodging needs of the senior population and is the largest sponsor of federally subsidized housing for the elderly in the United States. For more than 30 years, in a cooperative partnership with the U.S. Department of Housing and Urban Development, B’nai B’rith has made rental apartments available to senior citizens with limited incomes regardless of race or ethnic origin. In New York, the Metropolitan Council was created in the early 1970s to coordinate the human-service efforts of Jewish community councils throughout the city. It does not turn away anyone in need, but its primary focus is the more than 300,000 Jews—that amounts to 1 out of every 5—who live at or below the federal poverty level in the Big Apple. Through its Kosher Pantry, the Metropolitan Council distributes monthly food packages— 4.5 million pounds of grocery staples—to 13,000 Jewish families, as well as vouchers for 2,000 families to purchase perishable items. Wizenfeld’s description of her organization’s clientele mirrors what Jewish relief agencies around the country are noting—including a disturbing new trend. “Because of the recession and mass layoffs, we are seeing well-educated professionals who are out of work and are unfamiliar with reaching out for help, even as their mortgages [or] rents keep coming and their savings evaporate,” Wizenfeld says. ‘The unemployment caused by the economic downturn has pushed many families to and over the financial brink who never expected to find themselves in this position,’ says Jewish Relief Agency Executive Director Amy Krulik. She expects the situation to become even more grim in the weeks and months ahead as more jobs are lost, the first recipients of unemployment benefits exhaust their government assistance, and savings are depleted. Fern and Russell Klein are emblematic of this new group. A special education teacher in Philadelphia until stricken with ovarian cancer, Fern, 47, has been on disability for the last seven years. Russell, 63, is a school music teacher who bolsters the family’s income—reduced by the loss of Fern’s paycheck—by giving private lessons. Even when their son became ill with Lyme disease, incurring $40,000 in medical expenses not covered by insurance, the Kleins managed to stay afloat by living frugally. Then, last year, Russell suffered a stroke and was out of work for six months. He has since recovered and returned to teaching, but the family has lost its financial footing. Their home, a simple rowhouse purchased 16 years ago, is headed for foreclosure. Today, they rely on the Jewish Relief Agency and other public pantries to put food on the table. Fern says the JRA, which receives funding though the Jewish Federation of Greater Philadelphia, family foundations, banks, businesses, and individual donations, is a godsend during difficult times. JRA food costs run about $20 a box; operating expenses are just under $1 million per year. The Kleins try to give back by joining the 700 to 900 volunteers arriving at the agency’s warehouse one Sunday morning a month to pack boxes, load cars, and deliver goods to 2,500 needy Jewish families. “It makes us feel like we’re helping them,” Fern says. At Jewish relief agencies around the country, it is not unusual to find volunteers who, in previous years, might have also written a check, but today find themselves in circumstances that makes donating money difficult. Every month, Nancy Braun, 64, joins other members from the B’nai B’rith Great Lakes Region who have been helping out at the Yad Ezra kosher food bank—where demand for its services has increased by 35 percent in the last two years—in the Detroit suburb of Berkley. Michigan has the highest unemployment rate in the country: 12.6 percent, according to the latest U.S. Bureau of Labor Statistics report, which was released in March. Braun is in this group: She lost her job as a patient-care coordinator more than a year ago. “I’m unemployed. It’s unbelievable to me,” says Braun. Braun’s husband, Bill, 70, also a member of the Great Lakes Region, is retired from the direct-mail business. Today, he supplements family finances by working as a courier. The Brauns manage despite the loss of Nancy’s income and count themselves among the lucky, particularly when they see who is coming through the doors at Yad Ezra. “There are familiar faces. They say, ‘Never did I think this would be happening to us,’” Nancy Braun says. “We’re fortunate to keep everything going in our life, but I can sympathize. I see all of these people losing homes and stores closing. In Kansas City, a consortium of Jewish organizations recently arranged for nationally renowned financial counselor Neale Godfrey to come and share insights with the community’s cash-strapped Jewish families. “It was for everything, all the way down to nitty-gritty issues like how to tell the kids, ‘We can’t take a vacation this year.’ This is not something we’d be bringing into the community in ordinary times,” says Rabbi Scott White of Congregation Ohev Sholom, a Conservative synagogue in the Kansas City suburb of Prairie Village. One indication of the way the economy is affecting Jewish communities, as well as individuals, is that Ohev Sholom recently canceled KosherFest, its popular outdoor fundraiser, which featured member-contributed comfort foods—chopped liver, noodle kugel, stuffed cabbage—and was responsible for 10 percent of the budget at the 180-family synagogue. White says there was no money to cover tent rentals, a necessity in the event of uncooperative weather. “The way we made our funding off it was not only people coming and eating, but [our] asking for sponsorship from philanthropic funders to underwrite our basic costs. We know they don’t have the income to give to a project like this,” says White. The shortfall coincides with an uptick in calls for assistance from within Ohev Sholom. These days, White is dipping into his discretionary fund to help cover congregants’ mortgage payments, rent, and utility bills. The surge in requests came as both SprintNextel, based in the Kansas City suburb of Overland Park, and a nearby General Motors assembly plant implemented substantial layoffs. This, in turn, has an impact on every other business in Kansas City and its surrounding communities. After observing a significant increase in calls for financial assistance, transportation, and kosher meals, and a tripling of requests for vocational counseling beginning in fall 2008, the Jewish Federation of Greater Washington (D.C.) formed a Community Crisis Assistance Fund with $300,000 from its own reserves. The federation also established Warm Line, a hotline that people can call to be directed to the relevant constituent agency. However, to maintain allocations at previous levels, more—and painful—measures had to be taken at the federation itself, Galperin says. “We were $2.5 million short, and we anticipated things were going to continue to be difficult, and we needed to…signal the community that we were taking heed. We retrenched about 10 percent of our staff , from the managing director down,” he says. “Senior staff, myself included, took voluntary pay cuts; we cut contributions to our pension plan for people under the age of 55; we initiated staff furloughs; and we cut expenses [in] food and travel.” The federation then approached its major donor families, most of whom have suffered financial losses in the market, and asked them to open their wallets. Again. By April, the shortfall had been met. Galperin says such gratifying response is typical from within the Jewish community as a whole and reason to believe that the needs of struggling and impoverished Jews will continue to be met, regardless of the growing numbers; regardless of the times. “They [members of the community] understand there are others who have less and they have come through. This is basically the Jewish concept of being responsible for one another,” Galperin says. “The wealth in the Jewish community has been affected in a permanent way. There are some estimates that between 30 and 40 percent [of the wealth]…including foundations and endowments, has disappeared. “But if people understand what is going on and do what is right, we’ll get through this and come out stronger. I’m very optimistic that will happen,” he says. B’nai B’rith International Executive Vice President Daniel S. Mariaschin concurs: “Organizations focusing on poverty are also facing problems of their own, as fundraising for those programs is down because giving is down. p>At Jewish relief agencies, it is not unusual to find volunteers who, in previous years, might have also written a check, but today find themselves in circumstances that makes donating money difficult. Reprinted courtesy of B’nai B’rith Magazine, Fall 2009. Photos courtesy of Masbia.